With Holland known for its flat landscape, this is a great option for those not so keen on hilly terrain! This two-day ride incorporates two iconic capital cities with an overnight ferry in between. We begin the day with a welcome speech and safety briefing, before departing your chosen start location in London in your guided groups and heading east towards the coast. We provide three refreshment stops during the day, and before long arrive at the ferry terminal in Harwich. Our support crew will take care of your bike as you walk onto the ferry in time for dinner. Accommodation provided in en-suite cabins for the overnight crossing. Early morning arrival into Hook of Holland. Breakfast is provided on the ferry, before disembarking and being reunited with your bikes and bike guides. 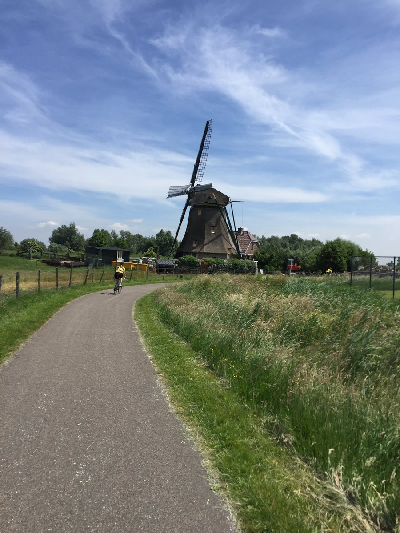 We then have some very flat riding along the Dutch coast, over bridges and small ferries, towards Amsterdam, finishing at the ‘I amsterdam’ sign. As usual we provide three refreshment stops during the day, along with a celebratory meal in the evening at a fabulous restaurant in the heart of the city.